I have to come clean here. As a parent of two young girls, I am often on the lookout for stories that provide strong female characters and feature empowering, not stereotypical situations. Therefore I frown on, but do not forbid, traditional pink/princess/fluffy stuff like Barbie, the Disney princesses and (gulp) My Little Pony. However, I know both my girls love My Little Pony, and I thought the new app from Ruckus Media deserved a chance at my house. Could it take advantage of the format and provide an experience beyond simple entertainment? The app is centered around a My Little Pony story called Twilight Sparkle: Teacher for a Day which I suspect comes from the television show. 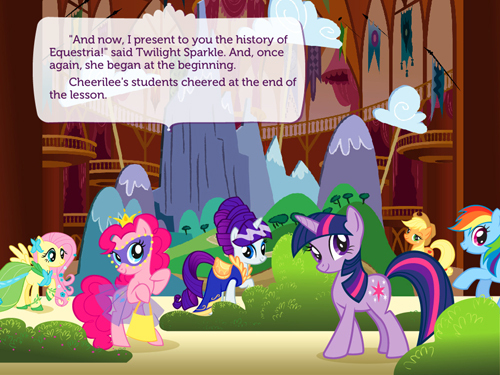 The story is straightforward enough, and features Twilight Sparkle’s adventure after she is asked by Princess Celestia to share a history lesson with the Cheerilee students about Equestria. The story features all the ponies your child knows from the show and the toy figures. Word highlighting is included when the ‘Read to Me’ option is selected on the main screen. I think this is a must-have feature for a storybook app and I’m glad to see it here. There are also little short videos that pop up between pages here and there that follow the story, as well as little bits of hot spot animation that are fun the first few run-throughs but don’t add a whole lot to the experience. Sprinkled throughout the story are optional activities like mazes and spot-the-difference panels. Completing these correctly wins the reader words, which can be used to fill in the blanks in Twilight Sparkle’s diary. Best of all, there are several of the randomly-generated activities, so kids don’t get bored when going back to try to earn all the words. Finishing the activities earns you words, which you use later on to complete several pages of Twilight Sparkle's diary. The diary is my favorite feature of this app, because it could be used to help kids hone reading comprehension skills. The reader uses the words collected along the way to fill in the blanks in the diary. Tapping on a single word reads it to you, and once you’ve placed all the words in their proper spots you have the option to read the entire diary. 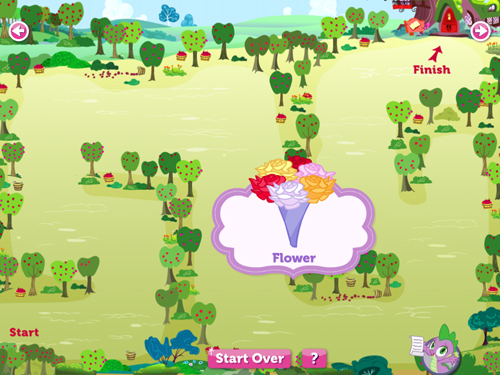 Use the words earned by doing the activities to complete Twilight Sparkle's diary. Of course, you can place any word in any blank you wish–which provides a fun Mad Libs-style wacky reading, if you desire. I admit I felt a little rebellious doing this! The main theme of the story (friendship and working together leads to great things) is hard to miss, but I liked the secondary theme even better (it’s OK if you’re not great at everything–ask a friend to help you out). And for my youngest daughter who loves all things girly, I’m happy anytime she chooses to interact with an app that aids literacy, even if pink princess pony parties are involved. Bottom Line: Great production values and familiar characters add up to a solid, if unsurprising, app experience. If your kids like My Little Pony, they will love this app. Reasonably priced in the App Store at $3.99, and the app is universal (designed for both the iPhone and iPad). When I heard that David A. Carter had developed an app in conjunction with Ruckus Media, I thought: “This is a match made in heaven!” My kids and I are already big fans of Carter’s pop-up books (I even have a copy of his wonderful Elements of Pop-Up, a hands-on how-to book for aspiring paper engineers) AND other Ruckus apps, so you can imagine how eager I was to try out Spot the Dot. But did it measure up to my high expectations? The app is not a storybook app–more like an activity book (in line with the other geometric shape pop-up books Carter has developed). There are ten ‘playspaces’ for the user to explore, all featuring a ‘find the colored dot’ activity. A clearly-articulated male voiceover guides folks through each playspace. Lively animation, a beautiful color palette and well-chosen sound effects and music add to the experience. The presentation is such that people of all ages will find themselves amused while searching for the elusive colored dot. And the icing on the cake: when the app is restarted, the dots will show up in a different location, so the puzzle solutions can’t be memorized! I consider that feature to be a real gift–straight from the app creators to me, adding exponentially to the replay value and entertainment factor. I don’t give out star ratings for my informal reviews, but if I did, Spot the Dot would get five stars out of five. I just love it! Get your own copy for $3.99 on iTunes (iPad only), or if you’d like to try it out for free before purchase, download the Lite version, which includes three of the ten playspaces for you to sample. What are you waiting for? Bartleby’s Book of Buttons: Vol. 1 Now FREE! I feel compelled to tell all of you that one of my very favorite storybook apps is FREE, now until its sequel is released next month. Bartleby’s Book of Buttons: Volume 1 is wonderful in that it incorporates puzzles on every page that the reader must solve before going on to the next page. The video above is a walkthrough of the app from Kirkus Reviews (which awarded the app the Kirkus Star–well deserved, IMHO). My advice to you: run go get this app while it’s FREE. I really can’t recommend it highly enough, and I’m eagerly awaiting the next Bartleby adventure from Octopus Kite!